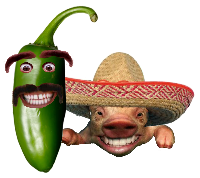 SmokingPit.com - Web site viewers. Meet some of my viewers as they raise a glass to BBQ! It doesn't matter what your cooking on as long as your having fun. All viewers displayed have given their consent and supplied the photos. To get your "mug" posted on this page you must be a viewer of this site and my SmokingPit Facebook fan page. The link is above. You must send me a pic of you raising a glass to BBQ. The pic should be no wider then 260 pixels. If you don't know how to format them just send it and I will do this for you. Provide some text thoughts on why you frequent this site and what you cook on. 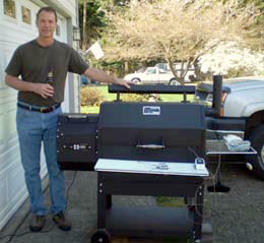 Rob, Smokingpit.com/you have been an inspiration to me since I purchased my pellet smoker nearly a year ago. I think that I have tried every recipe that you have on your site and have honestly not been disappointed once. 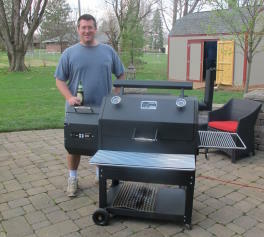 You not only provide guidance for new smoker owners (like myself), but you provide a truly family oriented function in this hectic day and time we now live in. It's kinda nice to have my son, father or other family member come over and participate in something as simple as preparing a nice meal. Family time has pretty much gone by the wayside, but you have provided a way for people like myself to spend a little quality time with loved ones. As I raise my tumbler high in the air, I salute you and the other viewers that take advantage of this simple called smoking/cooking. Merry Christmas and a wonderful New Year to all. 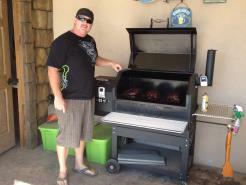 Guy Garfield My new grill the "Maxtailgator"
Max My name is Chris I live in Wichita KS. That makes it very nice for me to run down to All Things BBQ and lode up on all kinds of goodies. 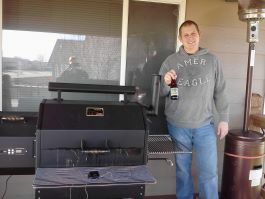 Here is a pic of me raising my favorite beer Boulevard Smokestack Series Tank7 beside my Yoder 640. 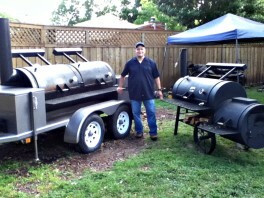 We also have three turkeys on the smoker in this pic that were treated with Mad Hunky brine. 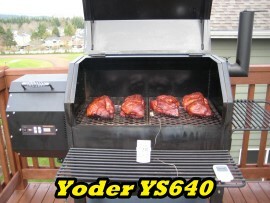 We love are Yoder and your web site we have try lots of your recipes and tips. The videos make it very helpful also. Keep up the good work! 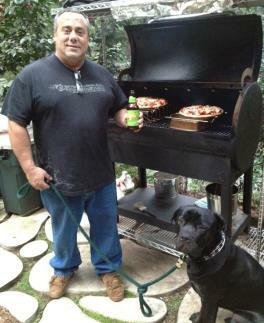 Two Italians in front of a grill full of pizzas with an ice cold Sierra Nevada. Hey Rob love the site and thanks for all the help you've given me in the past with my Kingman , I do almost everything on it with ease now. Here is a pic of me and my Frontiersman alongside the Kingman. 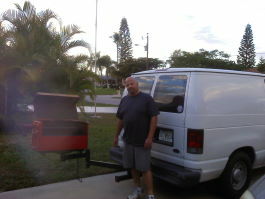 Thanks Rob and your a true pitmaster in my book.